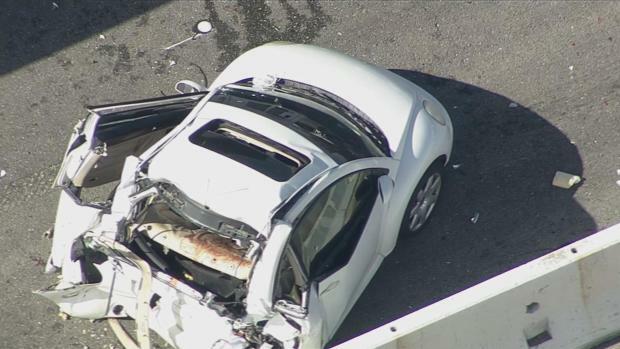 An Alameda County sheriff’s deputy, who was a father of four, was killed Friday after a commuter bus carrying Tesla employees smashed into his car on Interstate 580 in the East Bay. Ian Cull reports. An Alameda County sheriff’s deputy was killed Friday when a commuter bus carrying Tesla employees rear-ended his car on eastbound Interstate 580 at the Altamont Pass, according to law enforcement officials. The deputy was identified by Sheriff Greg Ahearn as Sroeuy Khin, a father-of-four who would have celebrated his 51st birthday tomorrow. Fifty-one Tesla employees were en route to Stockton in a white 2016 Temsa touring bus contracted by their company, California Highway Patrol spokesman Derek Reed said. Khin, who joined the sheriff's office in 2007, was heading to his Central Valley home after having worked overtime at the Santa Rita Jail, Ahearn said. He was driving slowly or had stopped in the No. 2 lane, according to CHP Officer Christopher Sherry. His white 2002 Volkswagen Beetle was crushed when the bus rammed into it, and Khin was pronounced dead at the scene. "It's a tragic loss for his family," Ahern said. "He was just trying to do his best to earn some extra money to take care of his wife and family." An Alameda County sheriff’s deputy was killed Friday when a commuter bus carrying Tesla employees rear-ended his car on eastbound Interstate 580 at the Altamont Pass, according to law enforcement officials. Michelle Roberts reports. The bus driver, who has been cooperative with officials, said that the sun's glare was blinding in the moments before the collision. Sherry said that the cause of the crash is still being investigated, but drugs and alcohol do not appear to have contributed. Sherry estimated that the bus was traveling at around 65 pmh when it slammed into Khin's car. One person on the bus sustained minor injuries. Investigators are also trying to determine whether Khin had, in fact, stopped or slowed down or if he was perhaps trying to move to the shoulder on I-580. 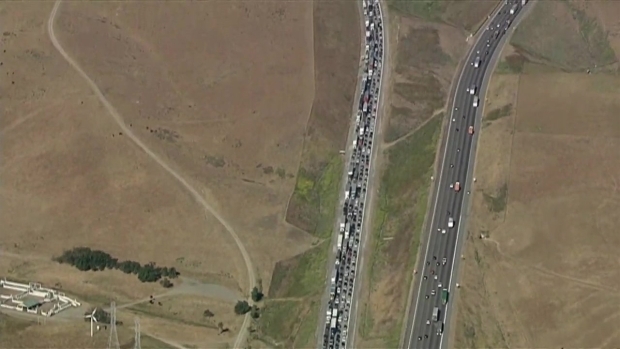 The CHP issued a Sig-alert on I-580 at Altamont Pass, closing the eastbound No. 1 and 2 lanes for hours, prompting vehicles to back up for miles. The entire highway was reopened around 1:45 p.m. but residual delays were expected. CHP officers who responded to the accident did not know Khin was a sheriff's deputy, but identified him based on his license information, Ahern said. 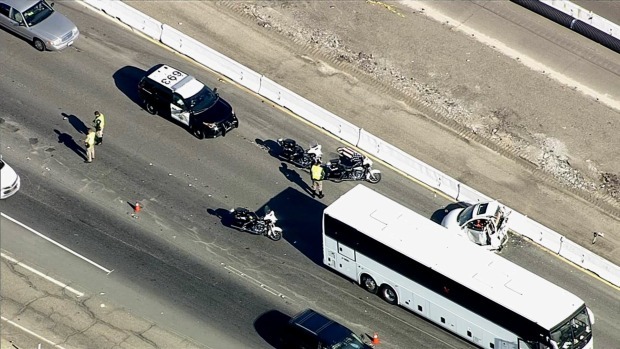 An Alameda County sheriff’s deputy was killed Friday when a commuter bus carrying Tesla employees rear-ended his car on eastbound Interstate 580, according to law enforcement officials. Bob Redell reports. Footage from the scene showed CHP officers gathering around the body, and saluting and draping it with an American flag. 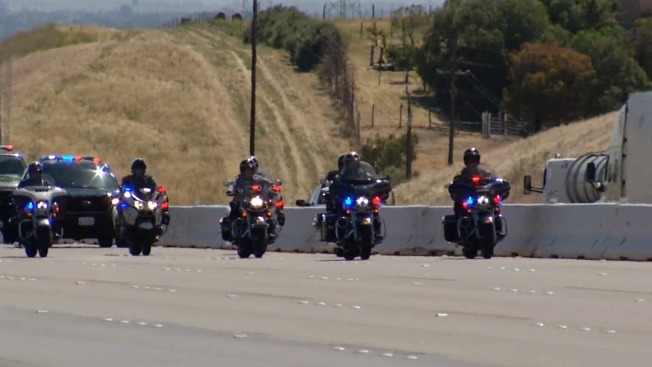 A convoy of law enforcement officials, including CHP officers from Dublin, also escorted Khin's body to the Alameda County Coroner's Office. Ahern expressed gratitude for the "dignity and respect" afforded to Khin on Friday. Khin was described by Ahearn as an extremely dedicated and hard-working member of the Alameda County Sheriff's Office. His fellow deputies were with his family after they learned of his death. "It's too much too soon," Ahern said. "It's heartwrenching." 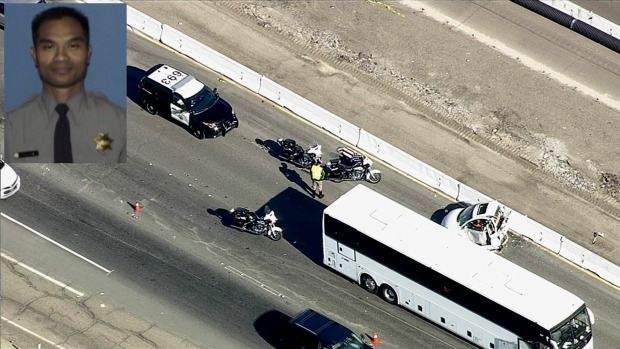 The CHP on Friday issued a Sig-alert on I-580 at Altamont Pass, closing the eastbound center and left lanes, after a deadly crash involving a bus and a car. Not only do sheriff's deputies face challenges and risks in their day-to-day work, but the "tight family" now has to "deal with the tragic loss of one of their brothers," he added. Khin's loss will reverberate through the department and he will be missed by everyone, "from line staff to command staff to myself," Ahern said. NBC-affiliate KCRA reported that Khin had previously worked for the Stockton and Jackson police departments. In a statement issued Friday, Tesla described the bus involved in the fatal crash as an "independently-operated shuttle." "All Tesla employees on the bus are safe and accounted for, however we are deeply saddened by reports that there was a fatality as a result of the accident. We will lend any support that we can to the authorities who are investigating the incident," the statement said. Sherry said Officers are interviewing witnesses and examining physical evidence at the scene. Criminal charges, if any, will be filed once the investigation is complete. People with information about the crash are asked to call 925-828-0466. NBC Bay Area's John Zuchelli contributed to this report.